Even with all the tools we have on hand, generating leads online is not easy. If it were easy, you probably wouldn’t be here reading this article right now. Arguably the biggest variable to attracting more leads are your landing pages. A few simple tweaks or edits can see you double or even triple your opt-in rate without having to spend a single penny. Struggling with conversion optimisation and getting your landing pages to convert? Then I bet you’re making at least 1 of these 3 mistakes. Prospects don’t magically appear on a landing page, although I wish they did. They usually click a link from AdWords, Facebook, your company blog or some other traffic medium. The link is often accompanied with some copy putting the link into context. How enticing and relevant is your copy? 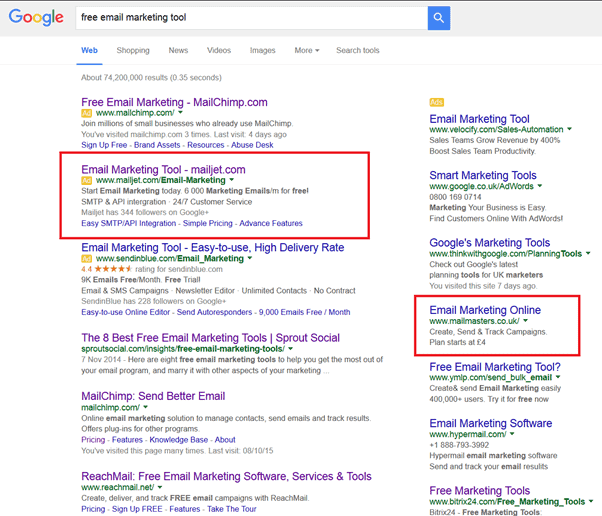 I’ve highlighted two ads, one from Mailjet and another from Mailmasters. The Mailjet copy contains the word free, while the Mailmasters copy tells me their cheapest plan starts at £4. If you take both copies at face value, which one do you expect to receive more clicks from someone who wants a free email marketing tool? Mailjet of course.The £ sign will instantly repel anybody who is looking for a free service, shunning leads away. This is a huge fiction point for Mailmasters and will cost them many leads because their copy is irrelevant to the keyword searched, and fails to entice prospects by mentioning monetary numbers even when they have a free plan. You can find case studies proving and dismissing almost everything on the Internet. I’ve read studies that confirm long-form landing pages are best, and I’ve read studies saying the exact opposite. The truth is this: if prospects are sceptical about your business or product, your landing page needs more words. If you’ve branded your business well and prospects know you deliver quality, less content on your landing page is required. How do prospects feel about your business and products? 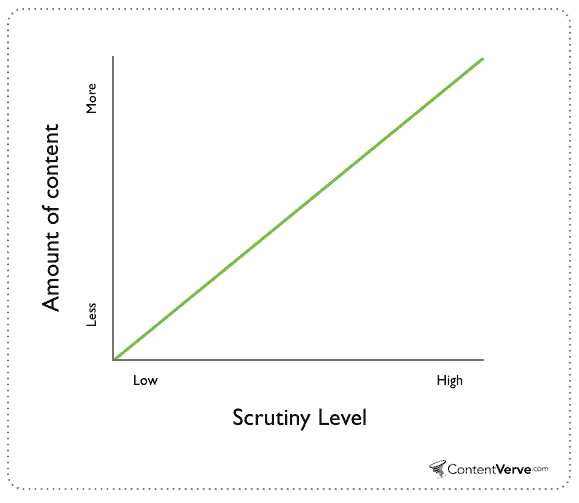 Add more content to your landing page if they have doubts, or take bits out if they almost never need convincing. Pro-tip: If you have prospects who fall on both sides of the argument, create two unique landing pages and drive new website visitors to the long-form page, and returning visitors to the short-form. No sane individual enjoys testing landing pages, it’s a very tedious and boring process. But if you’re serious about generating more leads online, you must test your copy. KISSmetrics have a great article that shows 100 different examples of businesses who ran simple A/B tests on their landing pages, and saw dramatic increases in opt-ins. Testing a landing page is not writing two copies and seeing which converts the best, it’s about understanding data and making educated decisions to find potential bottlenecks on your page. With this data you can then begin to test elements of your landing page to further optimise. Just guessing what the problem may be without using data is like looking for a needle in a haystack. A landing page is the entry point for customers to enter your sales funnel. You don’t have to spend hundreds of pounds hiring copywriters or need to buy expensive testing software, simply addressing the issues above can see your landing page produce more leads than you know what to do with.